At last, a use for those nasty-looking tiny plastic babies! 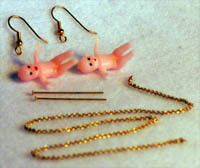 Our earrings use chain to simulate umbilical cords. They’re tasteless for any occasion, but are especially repugnant for baby showers. Using a tiny drill bit or a sharp pin, carefully pierce holes through the babies’ tummies. 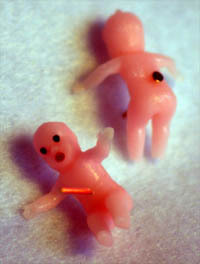 Insert a head pin through each hole, with the head at the babies’ backs. Trim each head pin as necessary and, using needle nose pliers, bend it in a loop. Cut the length of chain into two 2 or 3″ long pieces. For each baby, attach one end of chain to loop and the other end to ear wire. If desired, you can paint the baby to make it even more disgusting or to match your own skin tone.